Bric Brac is sometimes referred to as miscellaneous product or knick knacks. Bric brac can either be bought and sold as original donations (raw/credential) or salvage or recycled bric brac (e.g. from a thrift store). Buying and selling this product is not straight-forward as packaging and sorting must be taken into consideration. Packaging is important to both protect the fragile nature of some of the product (e.g. glassware) and maximize the weight of the load. 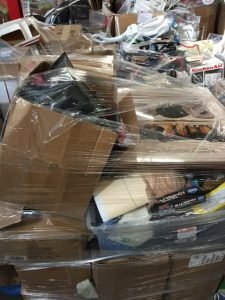 Items should be packed into a gaylord in layers starting with heavy non-breakable items followed by a layer of breakable items tightly packed. A small amount of cloth can be wrapped around the breakable items if necessary and they should be “nested” as much as possible. 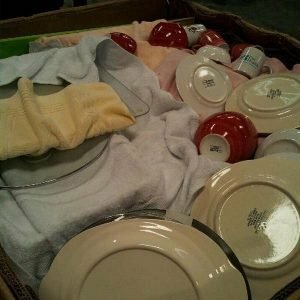 A layer of cloth can be placed between the layers of breakable and non-breakable items. An alternative is packaging tightly into small boxes. The pictures on this page provide a good illustration of well packaged bric brac product. Contact us today to place an order, sell product or for more information. Being a logistics leader in the global used goods business, Bank & Vogue source bric-a-brac in bulk. This can include the following products: Dishes, other kitchenware, vases, knicknacks, picture frames, photo albums, unused paper notebooks, porcelain dolls, collectibles, jewelry, glassware, small home décor, craft kits, non-electrical decorations, school and office supplies & more. We do not buy (or sell) the following Salvage or Recycled bric-a-brac product: Cloth, electronics, cameras, DVDs, CDs and vinyl records, books, toys over 3” tall, puzzles, games, plastics, wicker, baskets, cosmetics, loose candles, large items like bikes or basketball nets, any items too large to be lifted or carried by one person, plastics, broken items or trash. Bric-a-brac is packaged in boxes or gaylords for transport and has a minimum target weight of 12,000 pounds. Bank & Vogue sources, sorts and sells tons of bric-a-brac annually. Of course, credential or originally donated bric-a-brac will likely contain an array of household items that vary in value, size and quality. See the section above for more details and requirements, which will give you a better idea of what you can expect from our shipments. Salvage, recycled or “post-thrift” bric-a-brac will be sorted to some specifications. Take advantage of our experience, expertise, and logistics know-how to ensure a smooth process and the best prices. If your company is looking for wholesale bric-a-brac, look no further. Contact Bank & Vogue today to get started on buying bulk bric-a-brac.